The Transportation Boom after the Transportation Recession. “Our realized contract pricing forecast for 2018 is 6% to 8%, and current data is clearly signaling that the risk to our estimate may be to the upside,” Cass said in the report. Cass obtained the data from freight invoices that it processed for its clients ($25 billion in 2017). “The first four months of 2018 are clearly signaling that, barring a negative ‘shock event,’ 2018 will be an extraordinarily strong year for transportation and the economy,” the report said. 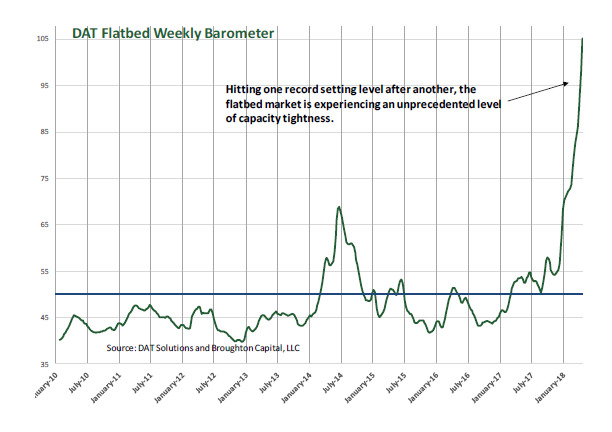 In terms of the industrial economy in the US, the DAT Flatbed Barometer is a good indicator, as flatbed trailers are used to haul big pieces of equipment. This includes demand from oilfield activity, which has been fired up by the rising price of oil, now at around $72 a barrel of the benchmark crude-oil grade, West Texas Intermediate. Flatbed spot rates in April shot up 26% compared to a year ago. Intermodal freight describes freight that involves several modes of transportation. In the US, this would mostly be a combination of truck and rail. This may be a container that is hauled by truck to an intermodal facility, loaded on a train, taken to the destination city where it is transferred to a truck for the final stretch. This may also include semi-truck trailers whose trajectory includes a stretch where they piggyback on special rail cars. 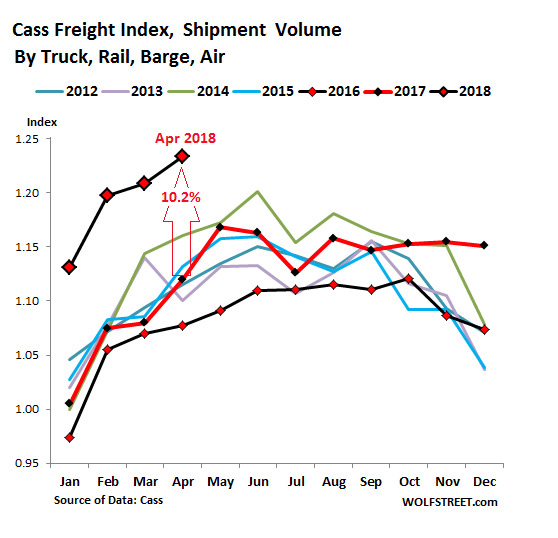 The Cass Intermodal Price Index, which includes fuel prices, rose 6.6% in April compared to a year ago, the 19th month in a row of year-over-year increases. 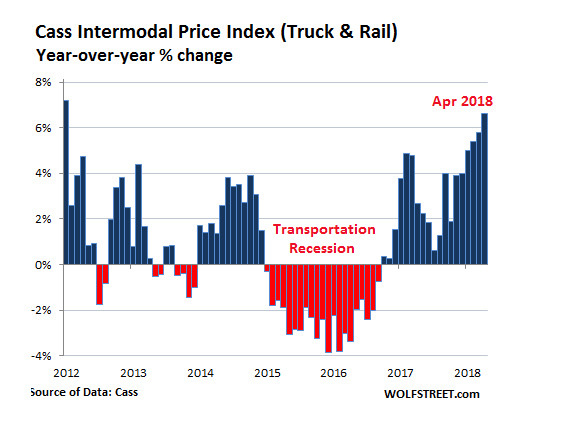 In terms of intermodal shipment volume, not pricing, the Association of American Railroads reported that so far this year through May 12, intermodal unit shipments rose 5.9%. 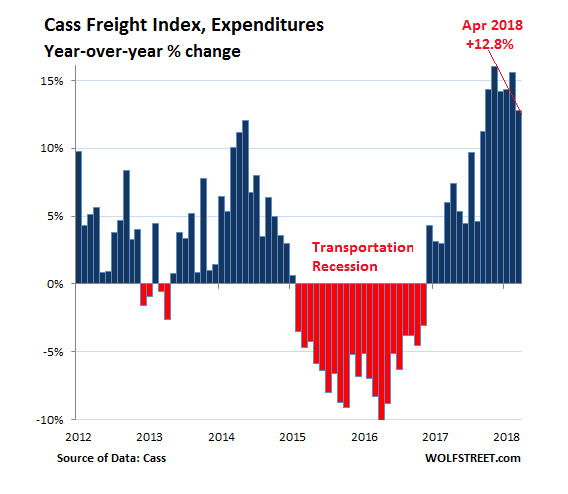 “April’s 12.8% increase clearly signals that capacity is tight, demand is strong, and shippers are willing to pay up for services to get goods picked up and delivered in modes throughout the transportation industry,” Cass noted. In other words, 2018 is turning into a transportation boom fired up by strong demand and tight capacity, leading to pricing power among transportation companies, and they’re able to raise prices and make them stick. Total retail sales were up 5.3% in the first quarter from a year ago, with e-commerce sales up 16.4%. Oil field activities are booming, and other industrial demand is also strong. 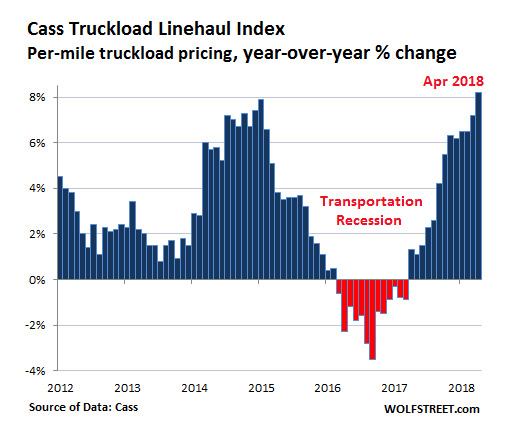 The transportation business is highly cyclical, given to ebbs and flows of high demand and tight capacity producing sharp price increases, followed by weakening demand and excess capacity. And for now, prices are rising sharply across the sector. But for many of the companies in the goods sector, these rising prices mean higher input cost. Numerous companies have already lamented those rising costs in their earnings calls, and they’re all trying to pass them on. Some are able to, and others are still trying. Via this mechanism, these prices are starting to work their way into consumer goods. And the Fed is paying attention. Read the original article on Wolf Street. Copyright 2018. Follow Wolf Street on Twitter.